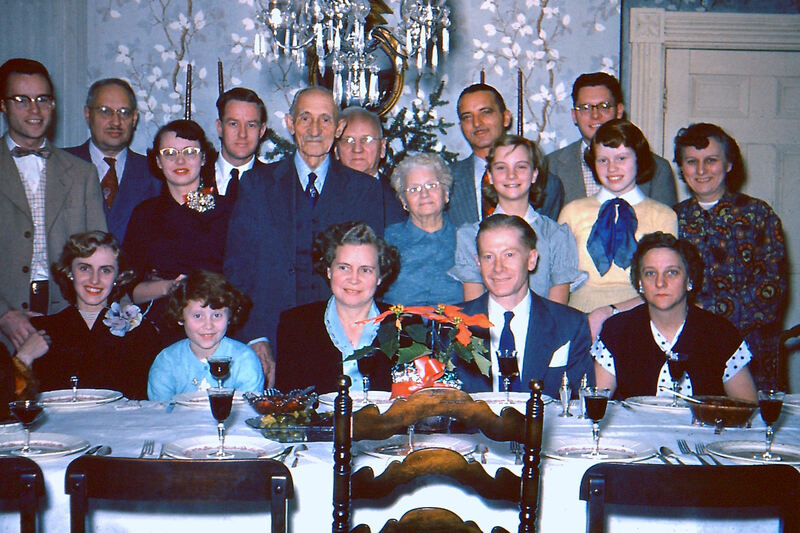 Christmas 1954 at the home of Thor and Ida Riis in Merrick, New York. Seated (left to right): Helene Hicke Riis, Helen Marie Lefgren, Helene Riis Lefgren, Arthur Lefgren, Helen Adams Henken; standing (left to right): Warren Riis, Thor Riis, Elizabeth “Betty” Riis Kavenagh, Edward “Ted” Kavenagh, Hans C. Riis, Abner Chauncey Adams, Kate Hand Adams, George Henken, Judy Henken, Robert Riis, Karen Lefgren, Ida Adams Riis. Not pictured: Marilyn Matthews (taking photo). Wow! It always made me sad to know I had cousins somewhere and never got to know them. I see my great-grandfather there, and I never met him. I had heard name from my mom and my grandmother: Warren, Bobby, Betty Jane — names without faces. I wish I had known you all back then. The Gustafssons were like that to me, which was puzzling because my Dad always said how much he liked his cousin Audrey. Let’s plan to get together in the not too distant future and swap stories! PS – Judy Henken in this photo is the Judy Mediatore you talk to from time to time on Facebook. How sad you never met your great-grandfather. He lived until 1959. I have no memory of him, but he did give me my teddy bear, which, of course, I still have.